A very unexpected request came in this month, and it has led to a flurry of activity. An long-term supporter of Aid Convoy, who was involved in sending us off to Kosova way back in 1999, has also long been passionately concerned about the victims of the conflict in Palestine and Israel. Upon hearing of an embryonic plan to send an aid convoy there, he thought it was clear that calling on us would bring some expertise to bear. The project developed extremely rapidly, and we quickly moved from offering logistics advice about vehicle choice and administration, into agreeing to send a volunteer as one of the convoy leaders, and to manage a team of new volunteers. Formed by individual fundraising groups all over the UK, under a central umbrella, this convoy in that sense followed a very similar growth pattern to those run by us to Kosova and Ukraine. The groups raised extraordinary amounts of money and filled over 100 vehicles with aid. Almost everything was medical aid, as we had been advised that Egypt would allow no other kinds of material across the border at that time. This meant medicines, medical supplies, and medical equipment. Many of the vehicles were fully-equipped ambulances. All were donated along with their contents, and the teams flew home. Our team-leading vehicle (the blue Ford seen above) was a minibus, which will be used as a schoolbus in good times, and a light-casualty ambulance should it be needed as such. The convoy passed through a historic route along the top of North Africa — including gaining passage between Morocco and Algeria, which is not normally an open border. All along the way, the reception was overpoweringly welcoming and encouraging. As we have seen before, bold humanitarian aid projects really can bring out the best in people! It was also our first chance to visit Libya, and began a process of relationship-building which may enable us to help in that country in the future. 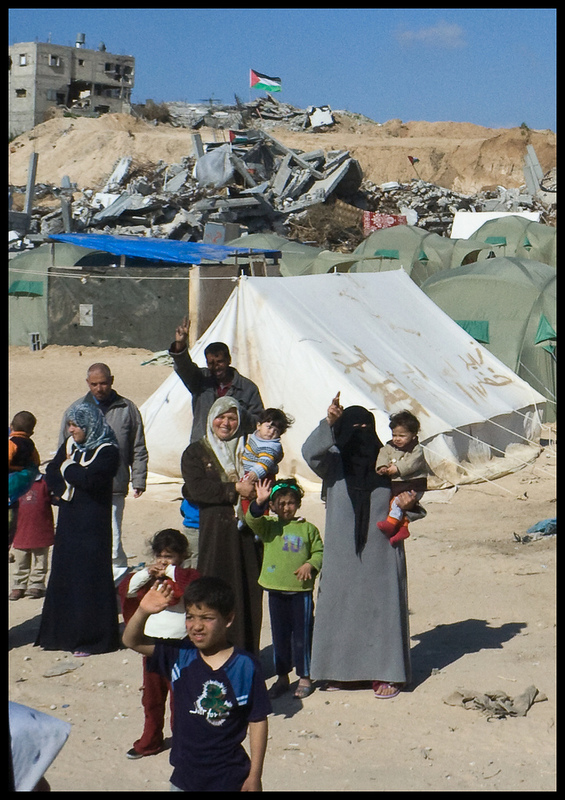 In Gaza itself, we witnessed at first hand the destruction caused by the military action in late 2008 and early 2009. Many buildings and farms destroyed, and people living in United Nations tents, often right next to the rubble, which remains strewn with hazards. In addition to the direct hardship caused by being rendered homeless, entire communities are also finding it very hard to farm land for food, or find paid employment. We were extremely well looked-after whilst there. Our physical security was obviously a big concern for the volunteers – boy scouts, and similar – who were helping us, and as with Kosova and Albania in the past, we made our stay as short as possible — we had to get the aid delivered, and make arrangements for the future, including ascertaining with whom we could work. But we also wanted to avoid being a burden to them, in terms of needs (water, food, etc.) and safety.